- You don't even have to write the manifest file yourself! PubTools includes a simple bookmarklet that developers can drag to their browser's toolbar. Just navigate to the web pages you want offline, press the "Generate Manifest" bookmarklet, and a dialog will appear with the full manifest file generated for you ready to cut and paste into a file. 1) Use the PubTools bookmarklet to create a Gears manifest file. Go to src/manifest-bookmarklet.html to get the bookmarklet and follow the directions. Save this to a file, such as manifest.js. 'shortcut.name' defaults to the HTML TITLE element if not present. 'shortcut.url' defaults to the page's URL if not present. Note that shortcut icons are only in the development version of Gears; the currently deployed version of Gears does not support shortcuts yet. PubTools will correctly continue to function if the user's installed version of Gears doesn't support shortcuts. When the page loads, the user will see "Download Offline." When pressed, everything in the manifest is made offline and the shortcut icon is created if desired, with the user given feedback on the process. Now, the user will see "Delete Offline." By pressing this a user can delete the offline resources and start over at a later date. If you don't want the default UI, your custom UI can call PubTools.downloadOffline() to initiate the download of offline resources, and can call PubTools.deleteOffline() to delete the offlined content. These can only be called after the page is loaded. 6) That's it! You're done. See the demos/ directory for a demo and boilerplate you can copy. Quick note: Make sure not to list the pubtools-gears.js file in your manifest file. The manifest generator takes this into account to leave this out, but if you create it by hand leave it out. We do a trick where when you are offline we simply don't have the file, which doesn't display the default UI to the user since it makes no sense to show that when offline. I've opened a code.google.com open source project for PubTools. I've done a bunch of QA testing on it, but make sure to file any bugs you might find. If you have patches send them in to me. "CONTEMPLATING his career path a couple of years ago, a young computer programmer named Brad Neuberg faced a modern predicament. "It seemed I could either have a job, which would give me structure and community," he said, "or I could be freelance and have freedom and independence. Why couldn't I have both?" As someone used to hacking out solutions, Mr. Neuberg took action. He created a word - coworking, eliminating the hyphen - and rented space in a building, starting a movement. While coworking has evolved since Mr. Neuberg's epiphany in 2005, dozens of places around the country and increasingly around the world now offer such arrangements, where someone sets up an office and rents out desks, creating a community of people who have different jobs but who want to share ideas." The SF Chronicle also had a front-page story on coworking as well. Its nice to see all the mainstream press on coworking! 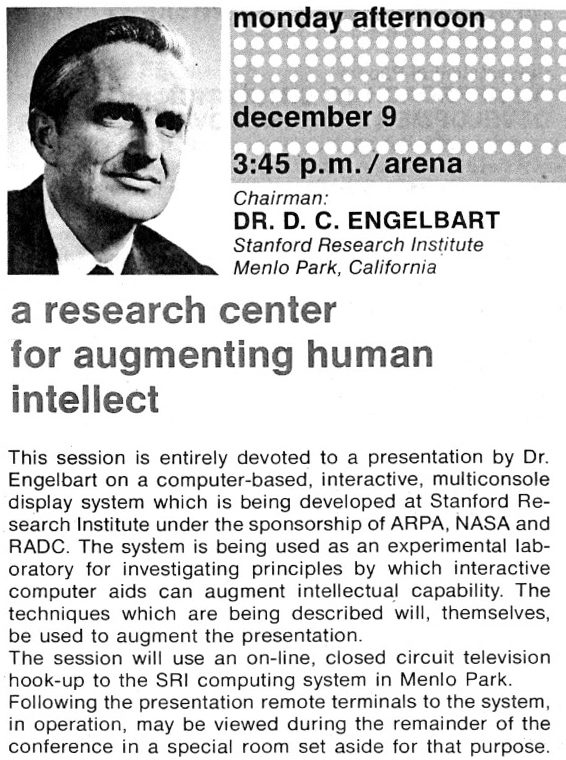 This session is entirely devoted to a presentation by Dr. Engelbart on a computer-based, interactive, multiconsole display system which is being developed at Stanford Research Institute under the sponsorship of ARPA, NASA and RADC. 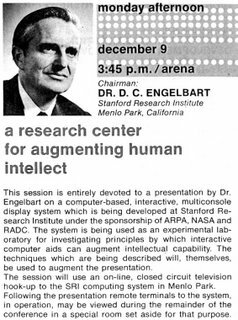 The system is being used as an experimental laboratory for investigating principles by which interactive computer aids can augment intellectual capability. The techniques which are being described will, themselves, be used to augment the presentation. The session will use an on-line, closed circuit television hook-up to the SRI computing system in Menlo Park. Following the presentation remote terminals to the system, in operation, may be viewed during the remainder of the conference in a special room set aside for that purpose.